If you have been looking for an expandable travel trailer that has a front storage deck, then your search is over because you will love all of the room for your off-road toys with this Autumn Ridge Outfitter 19RT! With the shade of the 10' awning you can enjoy visiting with your family and friends while watching your kids ride their bikes around the campsite. The front dinette is a great place to enjoy your meals, play a board game, or enjoy another cup of coffee. The rear tent end bed sleeps two people and is easy to set up at the beginning of your camping trip and take down when you are ready to go home. If you are looking for a compact trailer that is easy to tow, then you will want a Starcraft Autumn Ridge Outfitter expandable. 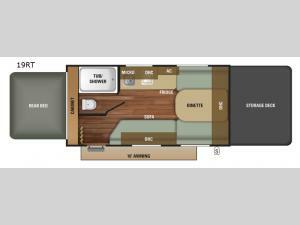 Each model offers a different set of advantages to help you do camping your way! Along the exterior you will find nitro-filled tires, tinted safety-glass windows, an outside shower, plus exterior speakers. Inside there is a command center with centrally located switches, Sandalwood Maple cabinets, plus stain and soil resistant carpet! You will also find that there are several packages available such as the Customer Convenience Package, the Premium Value Package and the Extreme Package! Come choose your model today!